Geniality and welcoming are the hallmarks of the several meetings we hold throughout the year, including an Annual Meeting in the spring. We rotate them among various locations in Southern California. 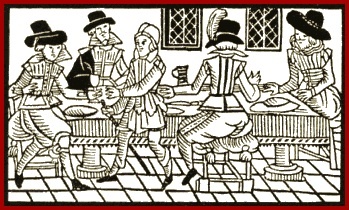 They are generally luncheon meetings held on Saturdays that feature either an eminent authority or one of our members as a speaker on Jamestown, an aspect of early American colonial history, genealogy, our ancestors and their descendants and other relevant topics or events. Our objective is to inform and educate in an engaging way. Our meetings offer opportunities to meet other Jamestowne Society members and guests who have links to our Jamestowne heritage and can share stories about their ancestors and their times. We especially welcome members of other companies, prospective applicants, and others wishing to learn more about Jamestown and our Society. Our next meeting will in late spring as our 2019 Annual Meeting, when we will celebrate our company’s 20th anniversary; please watch for details posted on our News Page. Also, please watch for the dates and details about our future meetings on our News page. We post information about forthcoming meetings on our News tab; we also send announcements directly to our membership and others. To suggest topics or speakers for future programs, please contact our Lieutenant Governor. January 26, 2019 at Baily’s Restaurant, Temecula, The program was presented by Michael Oddenino on the 400th Anniversary of the Landing of the First Africans in Virginia. October 20, 2018 at the Long Beach Yacht Club. Our speaker was member Erica Hahn, whose topic was How the Jamestown Colony Led to the Sailing of the Mayflower. February 24, 2018 at the Salt Creek Grille, Dana Point, CA; our speaker was Cheri Mello, whose topic was Deciphering the DNA Soup. June 24, 2017 Annual Meeting: A Genealogical Learning Experience at Green Dragon Tavern and Museum in Carlsbad; our speaker was genealogist KC Reid, who discussed Early Virginia Genealogy; how to find that elusive proof for a Jamestowne ancestor. February 18, 2017 at Tam O’Shanter restaurant in Los Angeles; our speaker was Dr. Jessica Stern, associate professor of History at California State University Fullerton, who told about Pocahontas: Her Life and Times in England and the 400th Anniversary of her Death in March 1617. November 12, 2016 at Knotts Berry Farm Hotel, Buena Park; our speaker was Professor Stewart Davenport, an Associate Professor of History at Pepperdine University. His presentation was on Tobacco in Colonial Virginia: From Boom to Bacon’s Rebellion. May 21, 2016 at the Officers’ Club at Marine Corps Air Station at Miramar, San Diego. We held a joint meeting and program about the history of flags of the United States with the San Diego Colony of the Society of Mayflower Descendants, followed by lunch and our 2016 Annual Meeting and Council elections. February 27, 2016 at the Brookside Golf Club, Pasadena, CA 91103. Our speaker was be Debbie McIntosh. whose program was A Visit with Matoaka (Pocahontas) – Native American Princess – Mrs. Rebecca Rolfe. November 21, 2015: We held our fall meeting at JT Schmid’s Restaurant in Anaheim. Our speaker was Dr. Dr. Mark Hanna, Associate Professor of History at the University of California, San Diego. May 30, 2015: We held our Annual Meeting at the Hahn University Center, University of San Diego. Our Speaker was Iris Engstrand, Ph.D., whose topic was Jamestowne in Context: The Age of Expansion. Dr. Engstrand is Professor Emeritus, and formerly chair, of USD’s Department of History. January 17, 2015: We held a joint meeting with several other lineage societies hosted by the Sons of Colonial Wars in California and Sons of Liberty chapter of the Sons of the American Revolution at the Los Angeles Athletic Club in downtown Los Angeles. Governor General Gerald Gettes Tyrrell of the National Society of Colonial Wars discussed The Purpose of Purpose. November 22, 2104: Our fall meeting was held at the South Coast Winery Resort and Spa, Temecula. Dr. Molly McClain discussed How Did Pocahontas Cook Bear/Bare – the Annals of Early American Cookery; a review if our ancestors’ culinary customs and practices. June 28, 2014: Our Annual Meeting celebrating our 15h Anniversary was held at the Rancho Santa Fe Golf Club. We elected new officers and Councilors for 2014-16, and viewed Jane, Historic Jamestown’s documentary chronicling the 2012 discovery and reconstruction of the remains of a young woman victim of the Starving Times. March 2, 2014: Regional meeting with Northern California and First Nevada-Arizona Companies at the Los Angeles Airport Marriott Hotel; Commemoration of the 400th Wedding Anniversary of Pocahontas and John Rolfe; Karenne Wood, Director of the Virginia Indian Programs at the Virginia Foundation for the Humanities discussed Pocahontas and Women’s Roles in Virginian Indian History. January 18, 2014: Joint meeting with the Society of Colonial Wars in the State of California and Sons of Liberty Chapter of the Sons of the American Revolution, Los Angeles Athletic Club, Los Angeles; Governor General Gerald Gettes Tyrrell of the National Society of Colonial Wars discussed Why Hereditary Societies are Important; Keeping Them Relevant and Solvent. June 15, 2013: Annual Meeting at the Long Beach Yacht Club, Long Beach, CA; Simon Spalding, Maritime Music Historian of New Bern, NC. January 19, 2013: A demonstration of English Country Dancing from the 17th century at the Mission Inn, Riverside. 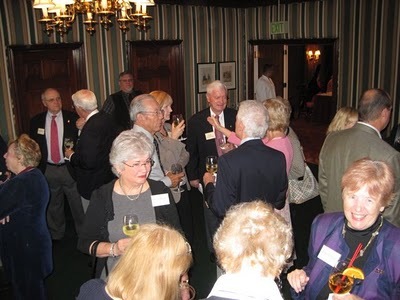 October 20, 2012: Kenneth Whittmore, Jr., Governor of the General Society of Mayflower Descendants in California, and Bev Nickerson, discussed Stephen Hopkins – After Jamestown and on to Plimouth at the San Diego Yacht Club. Both are Hopkins’s descendants. January 7, 2012: Kerry Bartels, Archives Specialist; An Introduction to The National Archives in Southern California at the National Archives in Perris. October 29, 2011: Diana Johnson, The French & Indian War: Prelude to Revolution; at the Porter Canyon Country Club, Northridge. June 18, 2011: Martha Pace Gresham and James McCall, The Paces; Pioneers at Jamestown and Points West; at the San Diego Yacht Club. 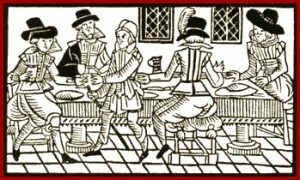 February 26, 2011: Barbara Barbarics, Elizabethan Clothing as a Clue to Class, Commerce, Christianity and Competition; at Walter’s Restaurant, Claremont. Oct 23, 2010: Martha W. McCartney, research historian and author of Virginia Immigrants and Adventurers, 1607-1635: A Biographical Dictionary; at the Regency Club, Westwood. 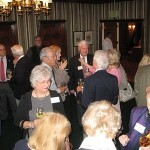 June 9, 2010: Dr. Richard Lederer, Fascinating Facts About Our Presidents at The Crossing, Carlsbad. January 9, 2010: Dr. Karen Ordahl Kupperman, author of The Jamestown Project; (we also were joined by Jamestowne Society Governor Carter Branham Snow Furr) at the Fairbanks Ranch Country Club, Rancho Santa Fe. November 7, 2009: Life on an Eighteenth Century Farm; at Riley’s Colonial Farm, Oak Glen. June 13, 2009: Dr. Rick Kennedy, Professor of History, Point Loma Nazarene University; With Decency and Good Order: The Religious Background to Architecture and urban Planning in Colonial Virginia; at the San Diego Yacht Club. February 2009: Dialog Among the Giants: Charleton Watkins and the Rise of Photography in California; at the Getty Center, Los Angeles. May 2009: Peter Mancall, PhD, Professor of History and Anthropology at the University of Southern California, and the Director of the USC-Huntington Early Modern Studies Institute; A New World, England’s First View of America, featuring John White’s watercolors (his keynote speech given at the Yale Center for British Arts exhibit); at the San Diego Yacht Club. January 2008: Ghost Tour of the Queen Mary, Long Beach. June 2007: Nancy Kilbourn, Native Americans that Jamestowne’s Founders Met in 1607; at Knotts Berry Farm, Anaheim. January 2007: Joanne Murphy, The Story of the Beginning of America, at The Pierpont Inn, Ventura. October 2006: Seth Mallios, PhD., Professor and Chair of the Department of Anthropology, San Diego State University, The Deadly Politics of Giving: Exchange and Violence at Ajacán, Roanoke and Jamestowne; at the Fairbanks Ranch Country Club, Rancho Santa Fe. February 2006: William Thomson, PhD., former Emeritus Professor and Dean, Thornton School of Music, University of Southern California, Music in Colonial America; at Taix Restaurant, Los Angeles. October 2005: Seth Mallios, PhD, The Jamestowne Rediscovery Project (Dr. Mallios was also a member of the original archaeological team at Jamestown Rediscovery and is Associate Professor of the Department of Anthropology, San Diego State University); at Taix Restaurant, Los Angeles. June 2005: Tour of the USS Midway; San Diego Harbor. February 2005: James H. McCall, Jr., Executive Director of the Eisenhower Institute, Pride, Prejudice, and the Politics of History; at Brookside Country Club, Pasadena. June 2004: Bob Rickards, Western artist, at Knotts Berry Farm, Buena Park. June 2003: Diane Johnson, Charlemagne’s Ancestors and the World in Which They Lived; at the Sheraton Four Points, Fullerton. June 2002: Harrison Tyler, Pocahontas, John Rolfe, the Harrison and Tyler lines and Sherwood Forest; at the Rancho Santa Fe Golf Club, Rancho Santa Fe. June 2001: Jamie May of the APVA Jamestown Rediscovery Team, The Discovery of the Lost Jamestown and the start of the Dig at Historic Jamestown, with photographs; at the Long Beach Marriott. June 16, 2000: The Organizing Meeting; Dee Rickards read the Greetings on the 1999 receipt of our charter from DeEtte Nesbitt, Governor, Jamestowne Society, at the Burbank Airport Hilton.